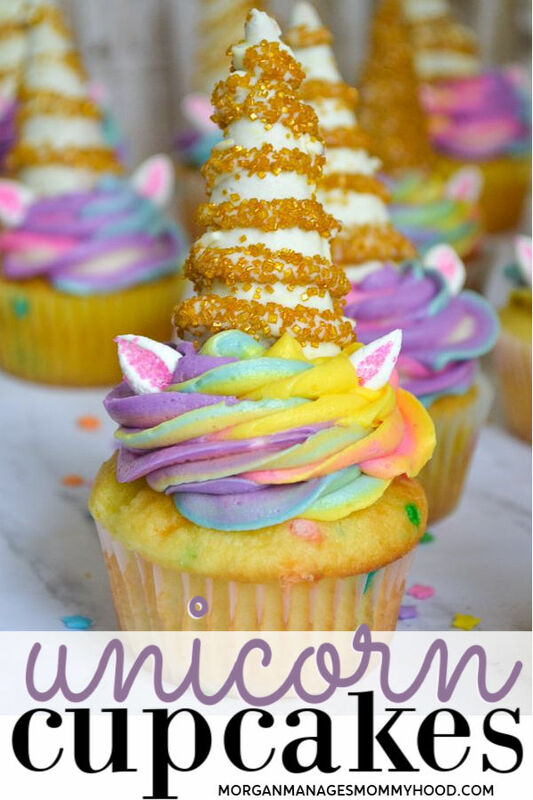 Unicorn cupcakes are a simple way to bring some magical fun to your next party. 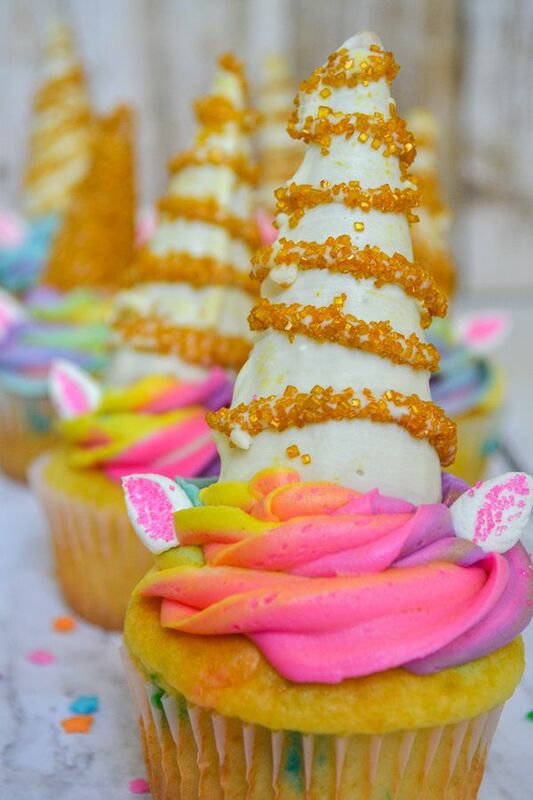 An edible unicorn horn and a rainbow of swirled frosting makes for a unique sweet treat. 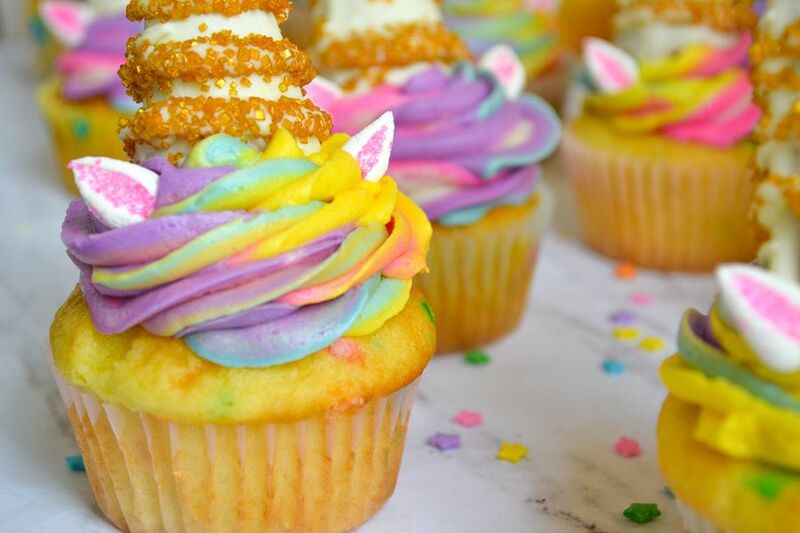 And, whether you’re bringing these to a unicorn loving little girl’s birthday or a throwback Lisa Frank party, they will be a gorgeous hit! I was born in 1990. Being a girl of the 90’s, you can dang sure bet I was obsessed with Lisa Frank growing up. Those psychedelic bears, bunnies, unicorns and puppies were what all of my girlish dreams were made of. ALL of my school supplies were a splash of glittery rainbow. Being a mom of boys’ boys, I rarely get the opportunity to let my inner Lisa Frank fly. The last time I did was with this Unicorn dip and fruit platter. Sometimes, I decide I really do not care and I want to make something girly and pretty. 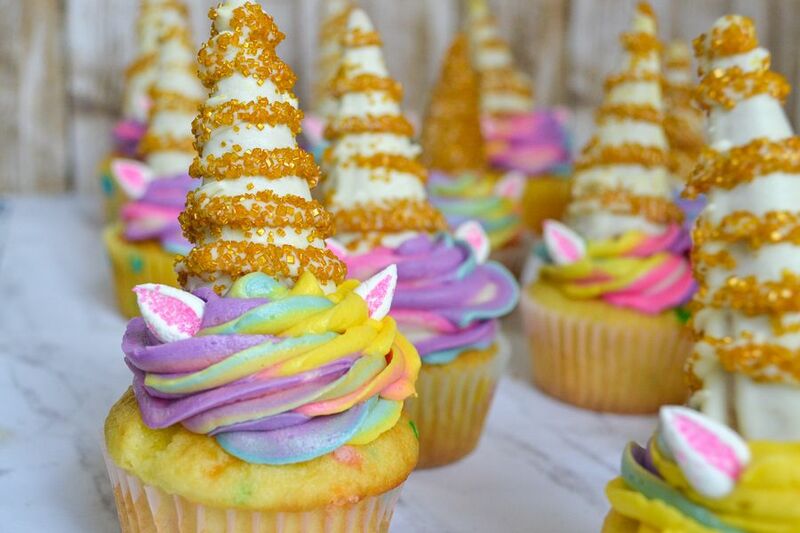 Which brings us to Unicorn cupcakes. If you’re looking for a magical treat you can make at home without fancy ingredients, look no further. These girly treats are sparkly, sweet, and full of color. Okay, they do take some planning to make, but don’t worry. 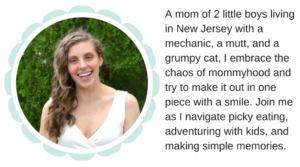 I’ve given lots of tips below for how to make it go faster! Looking for an easier treat? This Unicorn Dip and Rainbow Fruit Platter is just as fun! 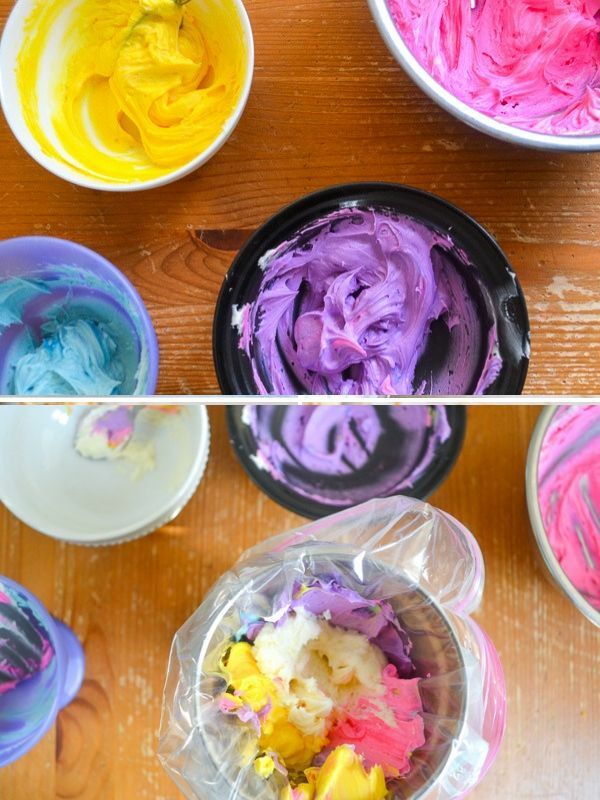 Both homemade and store bought frosting will work to make unicorn frosting. Just make sure it’s room temperature and stir to loosen is using canned frosting. I use boxed sprinkle cake mix. No shame. Make sure not to overfill your cupcakes liners, too. You can use your favorite cake (homemade or boxed, I won’t tell) but I suggest something with rainbow sprinkles. I think a pink strawberry choice would be fun too! The horns will be made with sugar cones. A full sugar cone will be too small. They do make mini cones, but they can be tough to find. If you only have the full sized ones, here’s how to cut them. First, score your cone by laying a serrated knife on your cut line and twist the cone to make a shallow cut. Then, “saw” through to make a smaller cone for your edible unicorn horn. 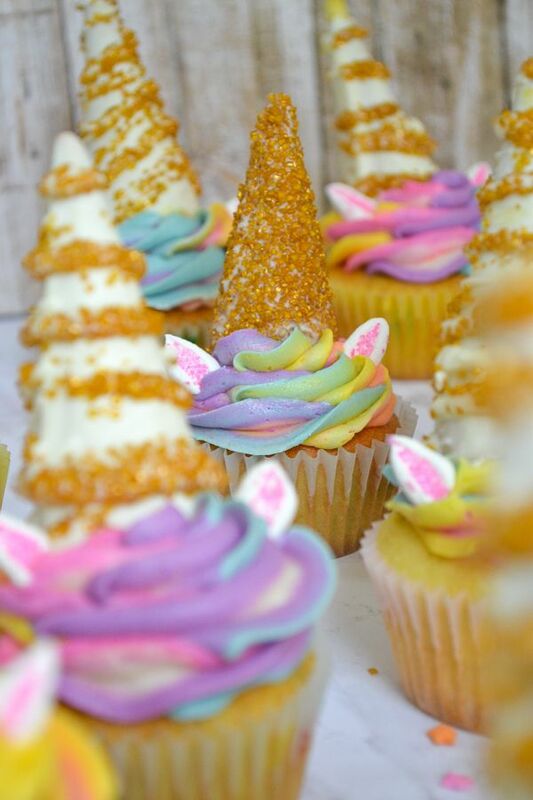 Make your edible unicorn horns. Next, dip your cone into white melting chocolate to coat. If the chocolate is too thick, add a bit of shortening to thin. I find putting a finger in the center of the cone and then rotating it into the liquid chocolate to be easiest. Allow to cool in the freezer sitting base down on parchment paper. Once set, get the cones back out and drizzle white chocolate across the horns, one at a time. Only do one side at a time. As soon as you drizzle the chocolate, immediately sprinkle each liberally with sprinkles. Drizzle and sprinkle ONE cone at a time to avoid the chocolate hardening before you add the sprinkles. Lay back down on the parchment paper on the undecorated side. Then, return all of them to the freezer for a few minutes. Finally, gently brush off any sprinkles in between the lines. Separate your frosting into 5 bowls. (Or however many colors you want.) Start with 1 drop of color per bowl, leaving one white. Stir and decide if you need more. Less coloring will give you more pastel colors. Gel coloring will give you more vibrant colors. The pink was gel coloring from Wilton. Red food coloring will make a lighter pink. I chose pink, blue, purple, yellow, and white. Prepare your piping bag – snip the end and insert a piping tip in. I have a random set of junky tips, but Google tells me I used the “Open Star Tip” here. You can easily use any tip, or just snip the end and have a round/circle edge. I don’t use a pastry bag, just a gallon sized zip top bag. Next, add the frosting to the bag. I set mine in a tall cup and folded the edges down around the outside to stabilize. Add the colored frosting to each side of your bag, then put the white in the middle. This will help create the varying colors. To make your unicorn ears, snip a mini marshmallow in half diagonally. Then dip the cut edge into pink sanding sugar. If necessary, pinch the top to make the ears more pointy. Pipe your frosting onto your cupcakes, making circles from the outside in. Then place on your horn in the center back of the cupcake. Finally, press the flatter side of your ears in on either side of the horn. Also, you can add sprinkles to this at the end, but I found I didn’t want to take away from the cuteness. Do you need a real piping bag? Nope. Honestly, I never use a piping bag. Just snip the end off of a gallon sized zip top bag. I suggest a piping tip to make the pretty edges, but even that isn’t necessary. How do you store these cupcakes? I sat them on a cookie sheet, topped with tin foil and refrigerated. You’ll want to take them out an hour or so before serving to soften the buttercream. The horn helps to keep plastic wrap or tin foil from sticking to the frosting. Do you need to use homemade frosting? Nope – you can totally use canned frosting. Just use at least 2 containers (I might even do 3 just to be safe) and seperate into bowls. Then color and add to a piping bag. An easier way to make the edible unicorn horn.. If the drizzling of white chocolate seems too time consuming, just dip the cone into the gold sprinkles and cover the whole thing. 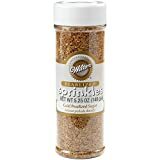 I bought these gold sprinkles an embarrassing amount of time ago and never used them. Thankfully, Wilton still makes them so you can grab these to make a majestic edible unicorn horn. Melt your white chocolate and dip the cone into it to completely cover. Add a bit of shortening to your chocolate if it looks too thick. Set on parchment paper, cut side down to cool. Place int he freezer 3-5 minutes to firm up. 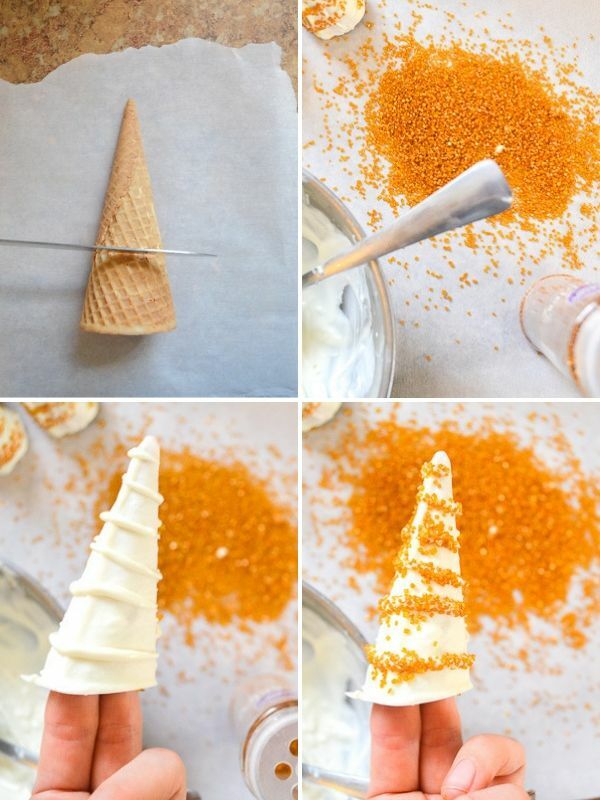 Drizzle white chocolate on one side of the cone, immediately sprinkling liberally with gold sprinkles. Set on the parchment, unsprinkled side down. Do all 12 cones, and return to the freezer to set. Repeat the sprinkle process on the other side of the cone. Add 1 drop of food coloring to each bowl. I used pink, purple, blue, yellow, and white. Stir and decide if you need more color. Add your piping bag to a tall cup and fold over the edges. I used an open star icing tip. Gently add frosting to each side of the bag, putting the white in the middle. Pipe your frosting on your cupcakes. 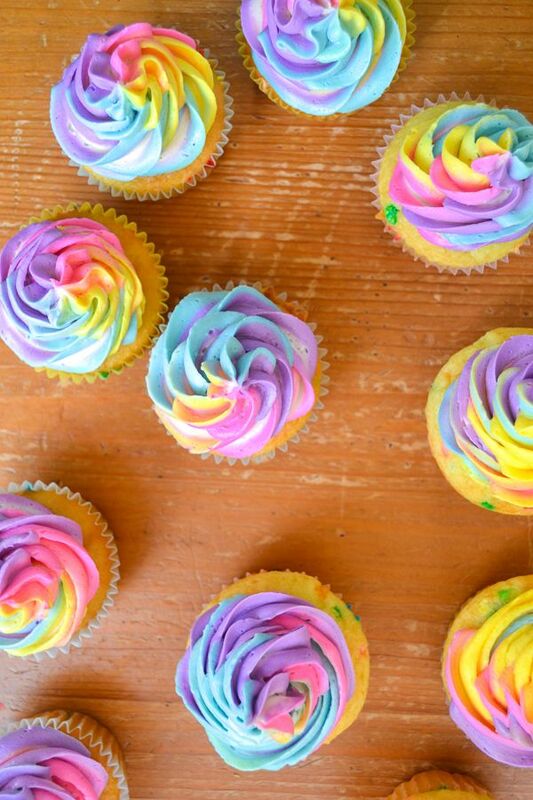 I used sprinkle cupcakes to go with the rainbow theme. Gently add your horn to the center back of the cupcake. Cut a mini marshmallow in half on the diagonal, and dip the cut side into pink sanding sugar. Finally, put your marshmallow ears into the frosting, flat side down. Gel coloring will make a more vibrant color. I used Wilton pink gel coloring. If you use normal red coloring, it will be a lighter pink. I use a normal gallon sized zip top bag as my “pastry bag”. Just snip the end and put your tip in the bag. You also don’t NEED a piping tip. Round would still be pretty! If using store bought frosting, make sure it’s room temperature and whip a bit to make sure it’s not too thick.